Director of Public Health & Family Welfare, Andhra Pradesh (AP Health & Family Welfare Dept. ) has released AP Health & Family Welfare Dept. Recruitment Notification-2018 for the post of 1500 vacancies for the posts of Mid Level Provider on contract basis. The Recruitment has complete details about their notification on its official website i.e., cfw.ap.nic.in and www.careers99.com. This is a good news for those who are waiting for Andhra Pradesh Govt Jobs. Candidates may apply offline before the Last date of the Notification i.e., 27/03/2018 before 5.00PM.And the remaining details for the recruitment like Educational Qualifications, Eligibility criteria, Age limit, No of vacancies, Post names, Pay scale, Job location, Application fee, Important links, Procedure to Apply are mentioned below. AP Health & Family Welfare Dept. Notification-2018 has released on its official website cfw.ap.nic.in. the last date to submit the application is 27/03/2018 before 5.00PM. All the Eligible Candidates may Apply Offline before last date, and the remaining complete details for the recruitment are given below. Interested Job Aspirants who are ready to apply for Director of Public Health & Family Welfare, Andhra Pradesh 2018 Notification must possess the below-given Eligibility Details. Less than 35 years. 40 Years for SCs and STs. Only Female candidates with BSc. (nursing) are eligible. Note: No preference will be given for higher qualifications. 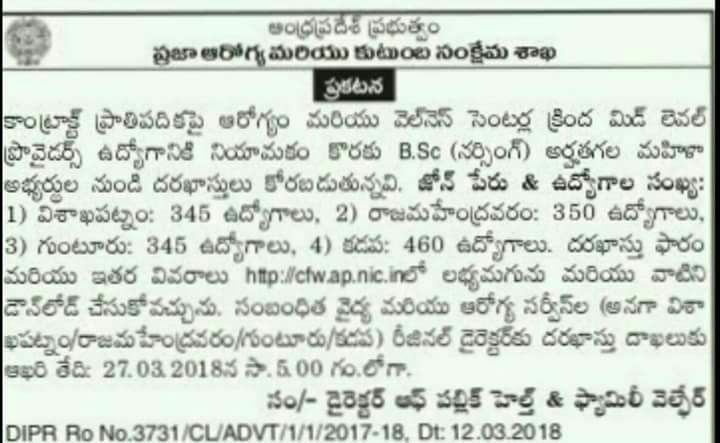 Eligible and Interested Aspirants are requested to Download Application Form from Below link of cfw.ap.nic.in Website and Submit it to the mentioned Address before Last Date i.e., 27/03/2018 before 5.00PM.